Father's Day is this Sunday! Can you believe it? May flew by and now so is June. 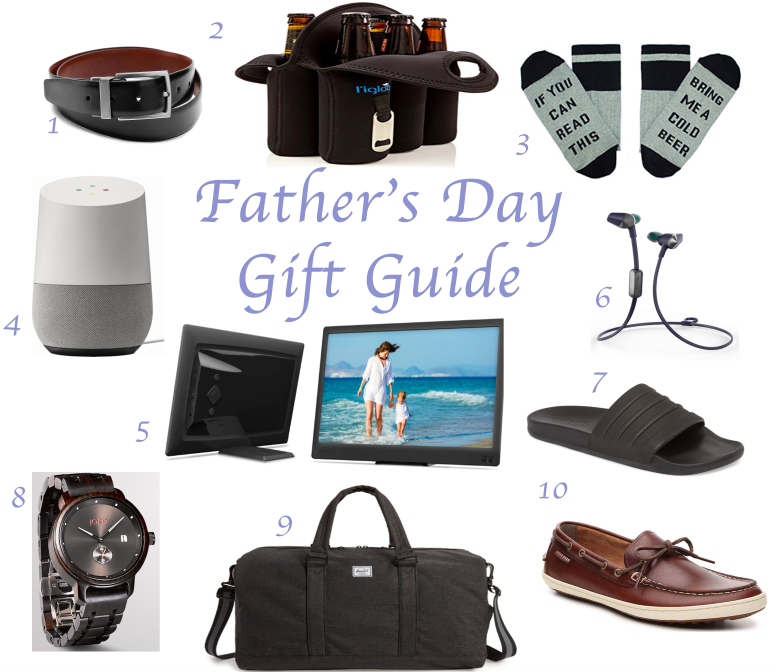 I have rounded up some last minute Father's Day gifts for you today, just in case you have procrastinated and could use a little help. Most of these picks are from Amazon, Nordstrom or DSW because they all guarantee delivery, Amazon without an extra charge if you have Amazon Prime. Also Nordstrom will wrap your gifts (I think Amazon does too) making a run to the store from wrapping paper unnecessary. Enjoy! An easy gift from DSW at a great price. This plus the funny socks below would be a great combo of a useful gift and a gag gift. Even if your dad doesn't drink a lot of beer this can be so useful for backyard get togethers and hosting friends. It's from Amazon and gets great reviews. These socks are from Amazon and come in several different versions. Wine, beer, coffee, pizza etc. They are such a cute gift. My dad loves his Google Home. He talks to it and asks it for jokes all the time. Honestly if I hadn't gotten him one this past Christmas, I'd get him another one, it's just too soon. If you live far from Dad and he's not very tech savvy this is a quick and easy way to share photos with him right from your phone to inside his home. This actually wasn't my idea (ty KT), I had to give her credit. These earbuds are so great for active dads. My dad works out and my father-in-law walks a lot, both could use these earbuds that don't get in the way. Slides are so popular this year and not only for women. But I think this type of slide has been popular with the guys forever. They're laziness has finally rubbed off on us in the shoe department. I digress, these slides get great reviews and would be a loved and useful gift for any guy. I love Jord Watches. You can read all about why here. This Ebony and Iron watch looks so masculine and is a great price for an eye catching, quality watch. I bought a similar bag from Herschel from my husband about a year ago and he loves it. This one has a separate compartment for shoes and a reflective trim for guys who travel at night. Most guys love a boat shoe. My dad, my husband, my father-in-law and brother included. They're an easy, classic and useful gift. Just make sure to get a gift receipt because of sizing.